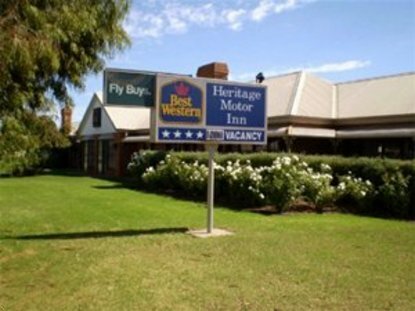 The Best Western Heritage Motor Inn in beautiful Corowa-Rutherglen offers a great holiday destination to do as little or as much as you like. Corowa-Rutherglen is parted by the peacefully majestic Murray River. Corowa is known as the birthplace of federation because of the 1893 Corowa Conference, which led to federation in 1901. It is also home to three licensed clubs with over 600 poker machines, a superb 27-hole golf course and the magnificent lawn bowls complex. Tennis, parachuting and water skiing are also features of the area. The 14 wineries at nearby Rutherglen are world renowned for their fortified and rich red wines as well as cuisine from casual picnic style to formal dining. Corowa's excellent variety of eating houses are all within walking distance from the Best Western Heritage Motor Inn, while a short drive will take you to the superb restaurants of nearby Rutherglen. For your convenience courtesy taxis can be arranged to clubs.